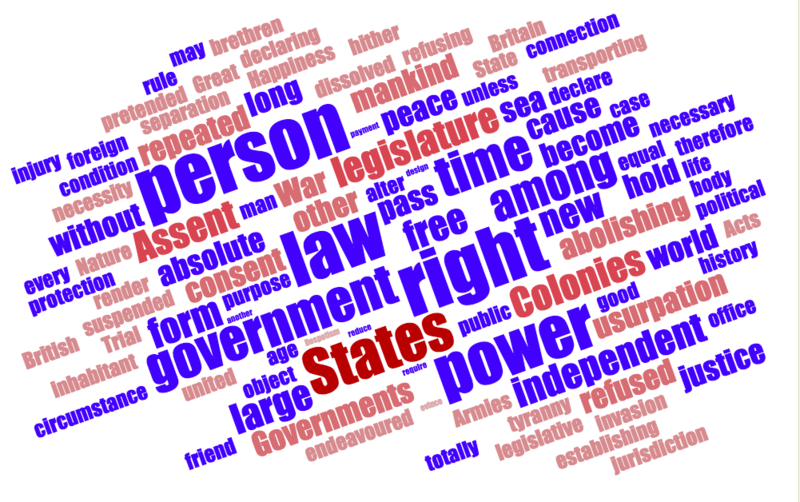 A WordSift.org word cloud of the Declaration of Independence (see above) visualizes how frequently Thomas Jefferson repeated words to emphasize or clarify an idea. 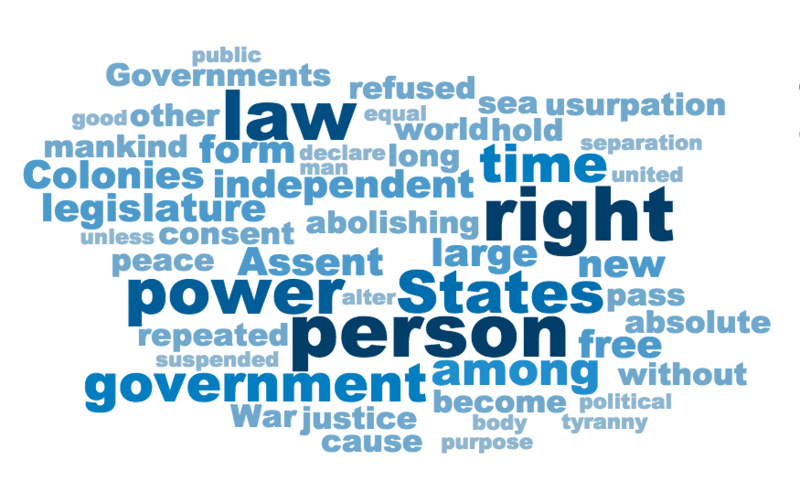 While he used the word “people” ten times, the Word Sift program contextualized “people” as “person”, which clearly amplifies the focus on individual rights The next most frequent words highlighted words, “right” (ten times), “law” (nine times) and “power” (eight times), are part of the legal claim for the American colonies to separate from England. 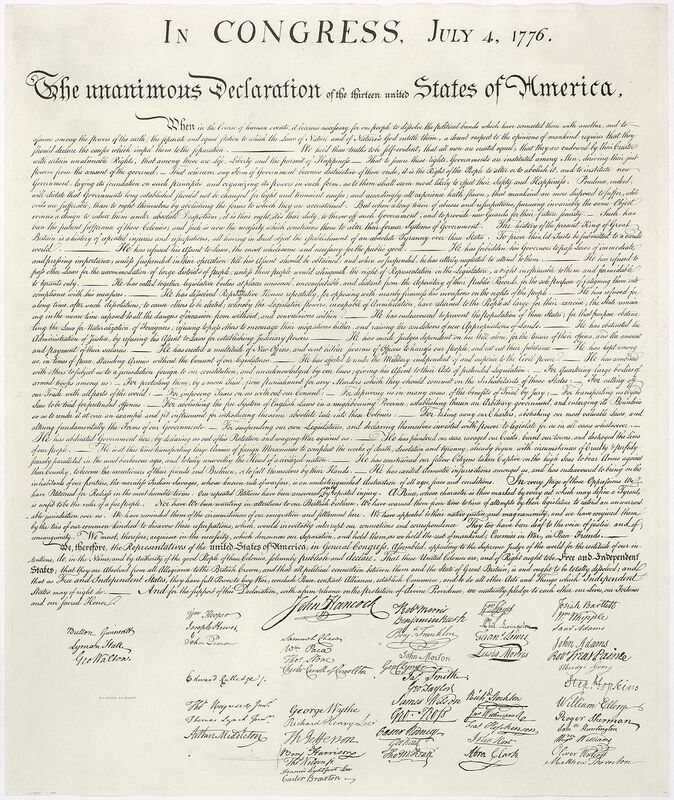 Teachers can prepare students for reading the Declaration of Independence by reviewing the vocabulary in advance and by showing the connection between a message and repeated language. While word cloud programs are common on the Internet, theWordSift.org program offers a feature to identify and sort different lists of words according to academic discipline (math, science, ELA, and social studies). In addition, the words from any document can be sorted for English learners according to the New General Service List (NGSL). The words on the NGSL are most important high-frequency words of the English language, and knowing the 2800 words on the NGSL list will give more than 90% coverage for learners trying to read general texts of English. The Visual Thesaurus can quickly show different meanings of the same word. The program also provides relevant examples from the selected text. Once the students are introduced to the language of the Declaration, they could review the similarities between Jefferson’s structure and the five-paragraph essay. Most students are already familiar with this structure. As students review the organization of the Declaration of Independence, they can also consider the complexity of the sentence construction. There are nine colons, eight semicolons, and 98 commas, roughly one for every 13 words, that force the reader to stop and pause, to consider Jefferson’s lists and supporting details. We would be happy if you think of it playfully – as a toy in a linguistic playground that is available to instantly capture and display the vocabulary structure of texts, and to help create an opportunity to talk and explore the richness and wonders of language! WordSift.org allows teachers to target instruction so that students understand 18th-century documents like the Declaration of Independence. This 21st-century tool helps students to explore “the richness and wonders of language” of our Founding Fathers in the document that made them citizens of the United States of America.